I'm told the Barberitos space is roughly 2000 s/f and should be open by mid June. Moe's, now owned by Atlanta-based FOCUS Brands, opened across from the Publix anchored The Peach shopping center in late 2000. Today Moe's has over 400 locations across the country and recently announced plans to grow its international presence. Not far away, in the former Johnny Rockets on West Paces Ferry, Miami, Florida-based Lime Fresh Mexican Grill recently opened their first of several planned Atlanta locations. 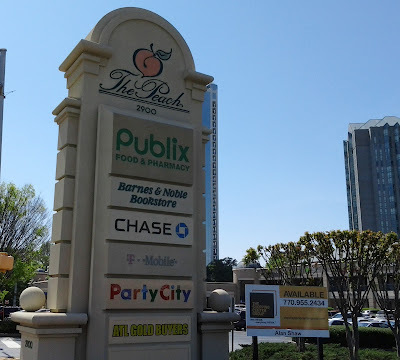 Another location is about to open in midtown, another is in the works in south Buckhead and yet another is in the works in Dunwoody. Barberitos more closely resembles Willy's Mexicana Grill than Moe's, but will surely compete with both. Barberitos has about 30 locations in a handful of southern states including Georgia, South Carolina, North Carolina, Florida and Tennessee. The largest presence is, of course, in Georgia, with 20 locations. Atlanta-based Willy's Mexicana Grill is of similar size to Barberitos locally, with about 20 locations, and recently opened their first franchised location in Gainesville, Florida. Both Willy's and Barberitos do have a presence in Athens, but Barberitos has three, compared to Willy's one. More importantly, Willy's has a following with intown residents, many of whom favor it over Moe's and and others. Oddly enough, legend has it that Willy Bitter, owner of Willy's, turned down a buyout offer from Martin Sprock, who later founded Moe's. Downing Barber, who founded Barberito's, reportedly worked for Willy's before opening Barberitos. As I reported earlier this week, Atlanta-based Tin Drum Asia Cafe will soon take on another similar eatery, Atlanta-based Doc Chey's Noodle House, when it opens in Emory Village next month. Similar to Barberitos opening in Buckhead, Tin Drum is entering a crowded market where there is existing neighborhood loyalty to Doc Chey's. This past January, Barberitos opened their first intown location within the Sloppy Floyd Building downtown. The location is categorized as an "express" location and is only open weekdays from 11am til 2pm. Where is your favorite burrito in Atlanta? Do you think Atlanta has too many "Mexican Grills?" What type of fast casual chain would you like to see open in Atlanta? I don't have the taste for any of the three that I once did, but given the choice, I'd pick Bell Street. Oh, all right, Barberito's, then. I remember them when they were a one-store baby on Clayton Street. Barberitos actually has a location downtown in government Twin Towers complex, just a lunch location. There's alot of UGA grads in Atlanta that love Barberitos. It should so fine.